The Sprig of Holly is about a dwarf who demands that Dora and Colin give him a year of their lives in exchange for the last piece of holly, which starts their negotiation. A fine lesson in refusing to settle a bargain rashly. Published in Stockton's collection, The Floating Prince, and Other Fairy Tales (1910). ONE Christmas, there was a great scarcity of holly in that part of the country where Colin and his little sister Dora lived. 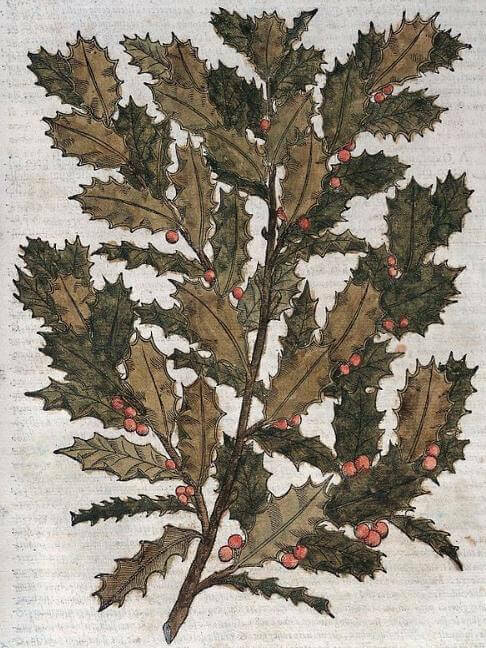 Everybody decorated their houses with Christmas greens, and as holly-branches and berries were particular favorites that year, Colin and Dora wished very much to get some to put up among the clusters of evergreens which their father had arranged over the big fire-place in their parlor at home. But not a leaf or sprig of holly could they find. "I tell you, Dora," said Colin, "we are too late. All the people have been out here, and have picked every bit of holly they could see. We ought not to have waited so long. It is almost Christmas now, and of course the persons who wanted holly came and got it a good while ago. I know one thing: I'm not going to put off picking holly, next year. I'm coming out into the woods before anybody else." "Yes, indeed," said little Dora. They wanted so much to find some holly, that they did not give up the search, although they had been wandering about so long. They had found an evergreen bush with some berries on it; but it was not holly. All at once, Colin saw a fine twig of holly, with several great leaves and some berries as red as ripe cherries, waving gently about by the side of a great tree. It seemed as if it must be the only sprig on some little bush. Without saying a word, Colin dashed forward toward the big tree, followed closely by little Dora; but when they reached the holly, they found that it was not on a bush at all, but was held by a little dwarf, who had been waving it over his head to attract their attention. "Hello!" cried the dwarf. "Don't you want a nice sprig of holly?" Colin did not answer at first. He was too much astonished, and as for Dora, she just stood close to her brother, holding tight to his hand. The dwarf did not appear to be big enough to do them any harm, but he was such a strange creature that it is no wonder Colin hesitated before speaking to him. He wore a high cap, a funny little coat, and his breeches and shoes and stockings were all in one piece and fitted very tightly indeed. "You do want some holly, don't you?" he said. "Yes," said Colin, "I want some very much. We have been looking everywhere for it, but couldn't find a bit." "There isn't any more than this," said the dwarf. "This is the last sprig in the whole forest. And it's splendid, too. There's been no holly like it in this country for years and years and years. Look what big leaves it has, and see how bright and shiny they are, and what a fine bunch of berries is on it! It's very different from that piece of bush you have in your hand. That's not holly." "I know it isn't," said Colin, "but I thought it might do, perhaps, if we didn't find any real holly." "But it won't do," said the dwarf. "Nothing will do for holly but holly. That's been settled long ago. You can have this, if you'll pay me for it." "How much do you want?" asked Colin. If Colin and Dora were astonished before, they were ever so much more astonished now. "Why—what do you mean by that?" stammered Colin. "I mean," said the dwarf, "that for one year you are to belong to me, and do everything I tell you to do." "I won't agree to that," said Colin, who had now recovered his spirits. "It's too much to ask." "Yes, indeed," said little Dora, clinging closer to her brother. "Well, then," said the dwarf, "what do you say to six months? I will let you have the sprig for six months of your life." "No," answered Colin, "that's too much, too." "How would a month suit you?" asked the dwarf "That's not a long time." "Indeed it is a long time," answered Colin. "I should think it was a dreadfully long time, if I had to do everything you told me to do, for a month." "Well, then," said the dwarf, "suppose I say a week. Nothing could be more reasonable than that. I'll let you have this splendid sprig of holly,—the only one you can get anywhere,—if you will agree to belong to me for only one week." "A day, then," said the dwarf. "I'll let you have it if you'll be mine for one day." Colin did not answer. He stopped to think. What could the dwarf want with him for one day? He might tell him to do something very hard and very wrong. Perhaps he would make him commit a burglary. That could be done in less than a day. "Oh, little girl, don't you want this doll? It's a splendid one, with wiggle-y legs and arms. You can have it for just one year of your life. Or, if you will be ours for six months, you can take it. Look at it! You can have it for just one month of your life. Or a week—a short, little week!" "No, I won't agree to it for a day." "Well, then," said the dwarf, "I won't be hard on you. Will you agree to an hour?" "A minute, then," said the dwarf. Colin hesitated. That was not a long time, but he might be made to fire a gun or do something very dangerous in a minute. "A second?" cried the dwarf. "Well, then, will you take it for nothing?" asked the dwarf. "Oh, yes," said Colin. "I'll take it for nothing." "Here it is," said the dwarf, "and I am very glad, indeed, to give it to you." "Well!" exclaimed Colin, in surprise. "You are a curious fellow! But I'm very glad to get the holly. We're ever so much obliged." "Yes, indeed," said Dora, and she fairly jumped for joy. "Oh, ho! little girl! Look here! You can have this doll for one short week of your life. For a day! For an hour! One minute! A second! Half a second For one millionth part of a second! For the twenty-millionth part of a half second! Or for nothing at all! You can have it for nothing!" But Dora heard not a word that they said, and never looked at them. "Why are you so glad to give me the holly?" said Colin to the dwarf. "And if you wanted me to have it, why didn't you give it to me at first?" "Oh, I couldn't do that," said the little fellow. "We always have to try to get all the work we can out of the boys we offer that holly to, and I'm glad you didn't make a bargain, because, if you had, I don't know what in the world I should have set you to doing. I offered it to a boy last year, and he agreed to do what I told him for six months. He wouldn't engage for longer than that, for his summer holidays would begin at the end of that time. And I know he thought he'd rather work for me than go to school. Well, I had a dreadful time with that boy. After the first week or two, I couldn't think of a thing for him to do. He had done everything that I wanted. I would tell him to go and play, and he would come back in an hour or two, and say, 'I've done playing; what shall I do next?' And then I'd have to shake my fist at him, and look as cross as I could, and tell him that if he didn't go play and stay playing, I would do something dreadful to him. But of course that sort of thing wouldn't do very long, and so I had to find work for him until his time was up. It nearly wore me out. I think that if he had agreed for a year, it would have driven me crazy." "But how did you come to have the holly sprig, if this boy earned it?" asked Colin. "Oh, the first thing I told him to do, after his bargain was made, was to give me back that holly. We have to do that, or else we couldn't keep on hiring boys." "I call that cheating," said Colin. "I suppose it is," said the dwarf, "if you look at it in a certain light. But we won't talk about that now. You have the holly-sprig, and I have no right to ask you to give it back to me. You can take it home, and I shall never see it again. Hurrah! Good-bye!" And he made one jump backward, behind the big tree, and was gone. Colin and Dora now hurried home, very happy, indeed, for no such sprig of holly had they ever seen as this which the dwarf had given them. It would look splendidly over the fire-place! The two little dwarfs ran after them as fast as they could. "Where had we got to?" said one to the other, just as they caught up to Colin and Dora. "We were at 'nothing,'" said the other. "All right, then, we won't go back on the bargain." "Little girl! will you have this doll for nothing?" Colin and Dora stopped short. This was truly a most astonishing sight. "Look at its legs and arms," said the larger dwarf. "See how they wiggle! You can make it sit down. Will you take it for nothing?" Thrusting the doll into her hands, the two little dwarfs gave a wild shout, and rushed away, with the long tails which they had to their bonnets waving in the wind as they ran. The children then hurried home as fast as they could, and when they had told their story and shown their gifts, great was the surprise and delight of everybody; for no one had ever seen such a large-leaved and bright-berried sprig of holly as the one the dwarf gave Colin, or so fine a doll, with such remarkably wiggle-y arms and legs, as the one the little dwarfs gave Dora. "The thing that pleases me most about it all," said their father, "is Colin's steady refusal to make a rash bargain, even for a very short time. Colin, my boy, I think you are to be trusted." "Yes, indeed," said little Dora, hugging her doll, and looking proudly into her brother's face. 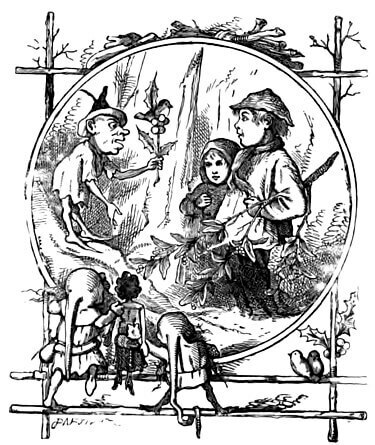 You might also enjoy reading Stockton's fairy tale, Huckleberry about riddling gnomes, and our collection of Children's Christmas Stories. Add The Sprig of Holly to your own personal library.